(CNN) -- Typhoon Morakot dumped heavy rain on Taiwan early Saturday and threatened to further soak the recently drought-stricken island. 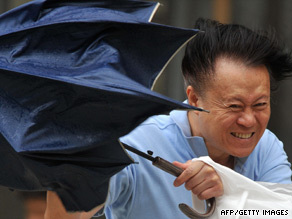 A man fights against strong winds in Hsintien, Taipei county, Taiwan, on Friday. As of 3 a.m. local time, the storm's eye was over the northern part of the island, CNN forecaster Kevin Corriveau reported, although he noted that slow-moving Morakot is so large it encompassed the entire island. Journalist Andrew Lee in Taipei, citing local media, said the storm had blown off roofs and washed out some bridges. Corriveau said the island has received more than 39 inches (99 centimeters) of rain from the storm, which he said was expected to dump another 39 to 47 inches (99 to 119 centimeters) of rain on Taiwan. Corriveau said the storm was expected to linger over the island for several more hours, and the southern portion of Morakot would likely be passing over Taiwan for hours after that. The storm's impact had already been felt by Friday morning, with mudslides and landslides occurring on the island. The area has been severely affected by drought in recent months, leaving the ground so hard that it does not absorb the rainfall, Corriveau said. The storm prompted airlines to cancel flights. Schools and government offices were closed ahead of Morakot's arrival, according to Taiwan's Central News Agency. Trading at the Taiwan Stock Exchange was also postponed until Monday, the news agency reported. In China, state-run Xinhua News Agency reported that governments in coastal provinces were readying themselves for the storm and had ordered fishing boats to seek shelter before Thursday night. In Fujian province, about 8.4 million text messages had been sent to citizens warning them to prepare for the typhoon, Xinhua reported. More than 900 people, including Chinese and foreign tourists, have been evacuated from the resort of Nanji Island off east China, the news agency reported. CNN's Brandon Miller contributed to this report.